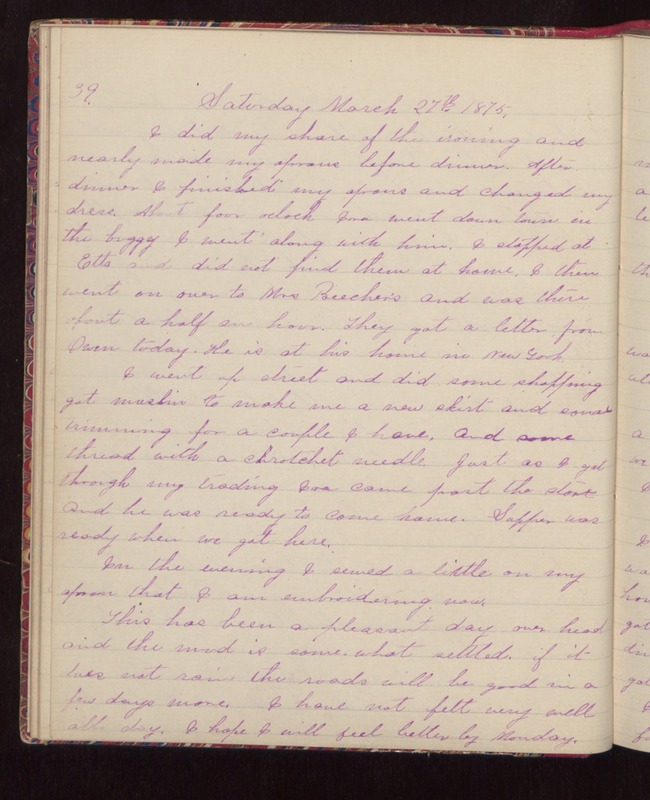 39 Saturday March 27th 1875. I did my share of the ironing and nearly made my aprons before dinner. After dinner I finished my aprons and changed my dress. About four oclock Ira went down town in the buggy I went along with him. I stopped at Etts and did not find them at home. I then went on over to Mrs Beechers and was there about a half an hour. They got a letter from Owen today. He is at his home in New York. I went up street and did some shopping got muslin to make me a new skirt and some trimming for a couple I have. And some thread with a crotchet needle. Just as I got through my trading Ira came past the store and he was ready to come home. Supper was ready when we got here. In the evening I sewed a little on my apron that I am embroidering now. This has been a pleasant day over head and the mud is some-what settled. if it does not rain the roads will be good in a few days more. I have not felt very well all day. I hope I will feel better by Monday.